[Press Release] InDevR launches a new product that could shave weeks off the timeline to deliver flu vaccines in the event of a pandemic. low-dose and adjuvanted flu vaccines. The panel of monoclonal antibodies that provide the test with virus subtype specificity were developed by scientists at the Center for Biologics Evaluation and Research (CBER) within the US Food and Drug Administration (FDA) and licensed by InDevR in 2017. Avian influenza viruses, especially A/H5N1 and A/H7N9 viruses represent the latest threat for a lethal influenza pandemic. According to the December 2017 Risk Assessment Summary by the World Health Organization (WHO), “Since 2013, a total of 1565 laboratory-confirmed cases of human infection with avian influenza A(H7N9) viruses, including at least 612 deaths, have been reported to WHO.” In response to concerns over these deadly H7N9 flu viruses, in 2017 the US government issued a call for new vaccines to include in the Strategic National Stockpile for protection of the US population in the event of an outbreak. To enable a rapid vaccine response during a severe outbreak or pandemic, there is a pressing need for a potency test that is rapid and has sufficient sensitivity to track potency in dosesparing and adjuvanted vaccines. The current gold standard method for flu vaccine potency determination, single radial immunodiffusion (SRID), falls short on all these counts. Most importantly, it can take months to develop the reference reagents needed to perform the SRID assay, which, as demonstrated in the 2009 H1N1 pandemic can delay the delivery of flu vaccine. In contrast, the VaxArray® Pandemic Hemagglutinin Potency product is ready for use “off the shelf” and, subject to regulatory approval for lot release testing, could be implemented immediately for dose-sparing and/or adjuvanted vaccines if a new, responsive H5, H7, or H9 flu virus emerges as a threat. 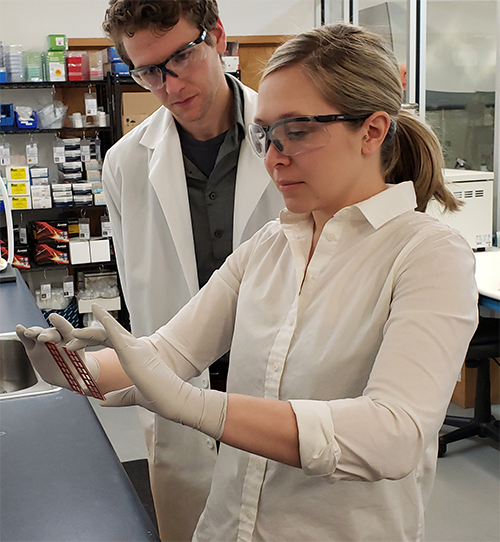 The new test kit complements InDevR’s VaxArray® Seasonal Hemagglutinin potency assay and InDevR’s potency testing service, which includes a potency assay for neuraminidase. More product information is available at: https://indevr.com/products/vaxarray/. This work was sponsored as part of the Department of Health and Human Services’ interagency Influenza Vaccine Improvement Initiative. Specifically, product development was supported by a Small Business Innovation Research grant R44AI102318 through the National Science. Driven. Innovation. Institute of Allergy and Infectious Diseases, which is part of the National Institutes of Health (NIH). The content is solely the responsibility of the authors and does not necessarily represent the official views of the NIH.